Practical and affordable? A couple of months ago, we evaluated Lenovo’s entry-level ThinkPad 13, which we found to be a good value overall. Today, we turn our sights to the Chromebook counterpart. Is it a viable alternative to the world of Windows? A year or two ago this would have been a strong contender for the best Chromebook around. But, with the likes of the Asus C302CA and C213NA offering (respectively) premium build and rugged performance, the ThinkPad 13 Chromebook has a harder fight on its hands. The Windows version of the ThinkPad 13 is a solid machine that doesn’t excel in any one area, leaving it in the middle of the pack. The Chromebook version shares most of its DNA, and what’s taken away in terms of hardware and software flexibility is accounted for with a cheaper price. We’re left with a lukewarm take on both the ThinkPad line and a Chrome OS machine, neither particularly thrilled not overtly disappointed. Most prospective ThinkPad 13 buyers will want to spend an extra hundred or two for the Windows version, which offers more connective options and literally millions of desktop applications (including the Chrome browser itself) without a hit to battery life or portability. 80% Lenovo ThinkPad 13 Chromebook Review: Is It Good for Business? 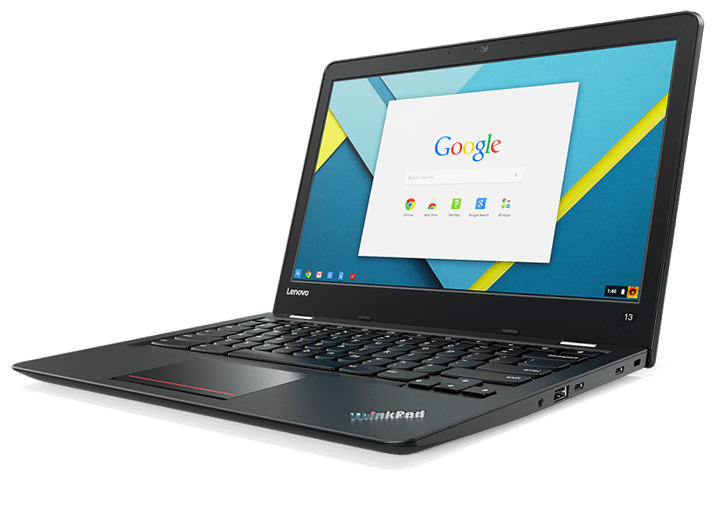 Compared to your average Chromebook, Lenovo's ThinkPad 13 Chromebook is a real workhorse. The system offers faster performance, longer battery life, stronger security and a tougher design than consumer-focused models. It also boasts the best keyboard you'll find on any Chromebook, hands down. So, as plain and straighforward this device is, you can tell it gets a lot right. And, to its credit, it doesn’t do much wrong. Middle of the road, plain, functional: whatever you want to call it, this Chromebook gets out of the way and lets you get a lot done. If a road warrior device is what you need and don’t really worry much about standing out at your local coffee shop, the Lenovo Thinkpad Chromebook 13 could be the device for you. A Chromebook is a Chromebook, I've heard some say. They're so simple that it all boils down to Chrome OS, and that is the same no matter which model you pick up. After using many different types of Chromebooks over the years, I can say that's not really true. Yes, Chrome OS is Chrome OS. The Chromebook itself, though, is obviously the sum total of all of its parts, and there truly are crappy models out there. Lenovo's Thinkpad 13 Chromebook isn't one of them. The overall construction and display quality, speed, and durability make for a Chromebook that is notable among many others, one that you won't be embarrassed to pull out at the office and that won't let you down when you need it the most. As far as chromebooks go, the Lenovo ThinkPad 13 is a solid performer on every level, but it simply costs too much for a Chrome-based laptop. That's a big problem considering that affordability is one of the main reasons to buy a chromebook. (Not to mention that, for $700, you can definitely find a good midrange Windows 10 laptop like the Lenovo ThinkPad 13$591.75 at Lenovo or the Acer Aspire R 14$699.99 at Acer.) While the base configuration price is more reasonable, there are many less expensive alternatives that perform well. 6300U: Skylake-based ULV dual-core processor for thin notebooks and ultrabooks. Offers an integrated HD Graphics 520 GPU and is manufactured in 14 nm.» Further information can be found in our Comparison of Mobile Processsors. 70.82%: This rating is bad. Most notebooks are better rated. This is not a recommendation for purchase.